Appearance: Reddish copper. Lazy, clingy robe. Nose: Alcohol, caramel, cola, oak, leather. A vague, undefinable Heaven Hill-ishness that instantly makes me think of the Bardstown Bourbon Heritage Center. On the palate: Medium-bodied. Pretty close to the nose. Vanilla Coke, old leather jacket, mango nectar, sweet cinnamon, allspice, oak. Finish: Sweet and fruity, then spicy cassia, then burn. Fades to a long-running tingle on the lips. 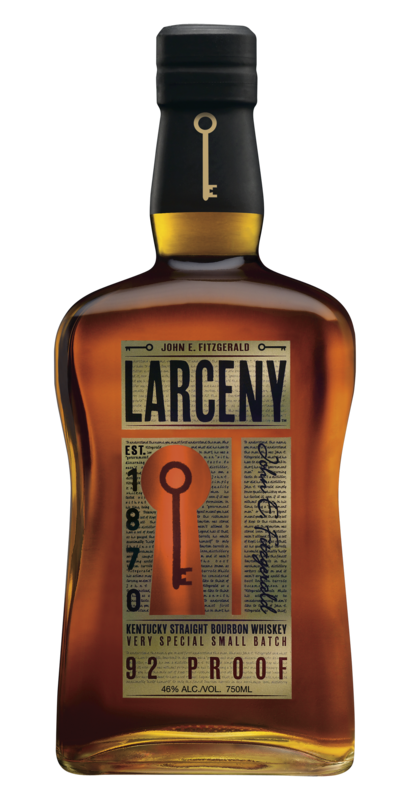 Parting words: Larceny is a brand-spanking new addition to the venerable Old Fitzgerald line of wheated bourbons put out by Heaven Hill. Heaven Hill acquired the line after United Distillers (a corporate ancestor of Diageo) closed the Stitzel-Weller distillery in Shively, Kentucky and divested itself of all its wheated bourbon brands (except for one, but that’s another show). Since the Heaven Hill acquisition, many bourbon lovers have considered Old Fitz a poor relation to the Weller wheated bourbons made by Buffalo Trace. Like the Parker’s Heritage Collection Wheated bourbon release of a couple years ago, Larceny is an attempt to rectify that. Larceny does not rise to the dizzying heights of the 2010 PHC, but it is definitely an improvement. It stands up to its competition, namely Maker’s Mark, Weller Special Reserve and even the 90 proof Old Rip Van Winkle. It would be a mistake to compare it to something older and more expensive than those. It’s delicately sweet like a wheater should be, with some nice fruit and spice not found in its peers. It lacks the bitter char notes that often crop up in Maker’s and sometimes overpower the Old Fitzgerald Bottled-in-Bond. Larceny won’t change your life, but it’s a pleasant weeknight sipper. It also paired nicely with a book I am reading about the theft of saint’s relics in the early middle ages. Larceny is recommended. The bourbon is fantastic–the rebate is not working correctly. The people at rewardsbymail are not sending the correct amounts on the rebates. Myself and a few others bought the 1.75 L and were anticipating a $20.00 rebate–we received a $10.00 rebate. That is false advertising, the good news is that we love the bourbon and have bought it again. But you can’t treat people that way and expect good things to be said about the product. Somebody in marketing needs to check on your rebate folks. I had not heard about those problems. That’s very frustrating. Did you try contacting them? I just got my $20 rebate! how long did it take for you to get your rebate?